It an almost widely acknowledged fact that any situation involving huge sums of money and wealth, its allocation and distribution has political dynamics surrounding it. The precise nature or dimension these politics take is something that has locked economists and political scientists over a turf-war of sorts over who is encroaching on whose territory and political economists in-between. Consequently, corruption – embezzlement and mismanagement of public funds are very much political just as the antithesis, anti-corruption is every bit political as well. The recent corruption scandal which the immediate former Speaker of the House of Representatives, Dimeji Bankole is embroiled in, along with the speed and fervour with which the government and the Economic and Financial Crimes Commission (EFCC) have pursued his arrest and indictment takes a particularly interesting dimension given all the political dynamics and intrigues surrounding it. One is left to wonder whether Bankole really is a culprit and is as guilty as they come, is a pawn in a larger political chessboard of “zoning” and power-sharing scheming or is a scapegoat in a ruse towards the international community. The former Speaker, Bankole is no stranger to allegations of corruption and misappropriation of public funds which have trailed him for a number of years now – from the N2.3 billion scam over the procurement of official Peugeot vehicles for House Members to the allegations made by House members like Hon. Dino Melaye, Hon. Independence Ogunewe and others which as we all remember resulted in the embarrassing free-for-all fisticuff in the hallowed green chambers last year. This time around, what got Bankole into trouble was the loan of N10 billion he obtained using the National Assembly accounts as collateral right after he lost his re-election bid. While the initial assumption was that the loan was a personal one, in a supposed desperate last attempt at primitive accumulation to cushion the sudden loss of official privilege and its perks, it became increasingly clear that the loan was secured to foot increases in quarterly allowances for House members. Days later, other shady deals were unearthed as $1 billion was allegedly found in one of Bankole’s domiciliary bank accounts operated by proxy. In addition, Bankole was said to have refused to appear before the EFCC for questioning and earlier attempts to arrest him were foiled by no other than the Inspector General of Police (IGP). Understandably, Nigerians are and should be justifiably and sufficiently outraged at such stupendous amount of money being misappropriated and laundered, abuse of office privilege and brazen disregard for and perversion of the rule of law at the expense of the impoverished masses. Thus, Bankole’s arrest by the EFCC now that he is no longer covered by constitutional immunity should be a welcome relief to everyone, symbolic of the “breath of fresh air” we have been promised from the stench of corruption all around the country and a pointer to the President’s “transformation” agenda and commitment to anti-corruption or is it? While most Nigerians are eager to welcome any sincere effort at tackling corruption, many are sceptical about this particular case and the way it is being pursued. Many inconsistencies abound raising pertinent questions such as: how come it took so long to unearth these sordid, corrupt dealings by Bankole? If earlier attempts on Friday June 03rd by the EFCC to arrest him were thwarted by the IGP (presumably on orders from above), then what made the IGP and the powers that be have a change of heart not to intervene in Bankole’s arrest on Sunday? On whose orders was the IGP acting on in the first place? If Bankole was able to embezzle so much, then what about other principal officers of not just the House of Representatives, but the Senate as well? How come the spotlight and intense scrutiny is not on them? 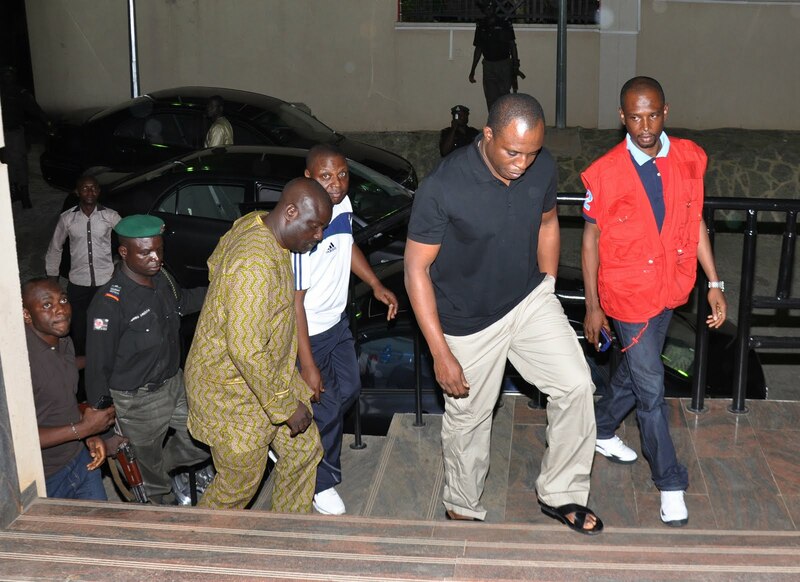 How come the EFCC is now in such a hurry to nab Bankole when there are cases of 31 ex-governors pending since 2007? Come to think of it, didn’t the EFCC Chair in 2008 state that evidence was still being gathered against them because their files were missing while they have been squandering and enjoying their ill-gotten loot? Or is there a scope and time-frame for the EFCC and by implication, the government’s anti-corruption crusade – say, from 2010 when Jonathan assumed the mantle of leadership onwards? With all these inconsistencies therefore, the main question is that: is Bankole simply a pawn in a larger political chessboard of politricks and balance of power scheming the ruling party is famous for? It is no hidden fact that the Presidency and top hierarchy of the PDP spared no effort to prevent the emergence of the widely favoured Hon. Aminu Waziri Tambuwal on Monday as Speaker of the House of Representatives in favour of their anointed candidate, Hon. Mulikat Adeola-Akande which they unsuccessfully tried to impose on the House. The gist is that Tambuwal and other officers were to be implicated in this N10 billion naira loan scandal along with Bankole to prevent his emergence as Speaker, so that the House would be under the firm grip of the Presidency and the PDP National Working Committee (NWC). Thus, Tambuwal had to disguise himself on Monday to gain access into the House chamber undetected, to avoid being arrested and thereby have his chances of becoming speaker jeopardized. This sounds like the plot of a Robert Ludlum novel! The Presidency and PDP bigwigs preferred the candidacy of Hon. Mulikat Adeola-Akande because not only was she the First Lady’s anointed candidate (ah! ah!? First Lady again!? ), but also because the party zoned the position to the South West where Mulikat hails from. Never mind that PDP topshots some months ago declared zoning to be “undemocratic”, “unconstitutional” and “dead” to pave way for the emergence of Jonathan as president against that principle, they now seem to be eating their own words and vomit. Or it could be that Bankole is simply a scapegoat, and this over-zealous commitment to his arrest and prosecution by the EFCC and the government is a ruse meant to pull the wool over the eyes of the international community especially as President Jonathan is now in the US attending a UN Security Council Summit on HIV/AIDS and would subsequently meet with US President Barack Obama. Given the lacklustre performance of the EFCC over the past one year, the calibre of people around Mr. Jonathan who have a litany of fraud allegations against them such as ex-President Olusegun Obasanjo prominent role in the mismanagement of $16 billion for power sector reform and Chief Anthony Anenih’s Houdini tactics that made N300bn allocated to his ministry disappear into thin air amongst others, it could be argued that President Jonathan is desperate to show the US in particular a (faux) commitment to tackling the menace of corruption and given that the US had issued a scathing criticism of the EFCC under Farida Waziri’s leadership. Thus despite the EFCC’s claims that it had received numerous petitions to investigate fraud allegations against the ex-speaker, this N10 billion loan taken by Bankole at the twilight of his tenure, the removal of the toga of immunity against prosecution, plus the intense attention the case has received all couldn’t have happened at a more appropriate time for a new administration boggled by dismal record in effectively tackling corruption to cash in on, eager to prove a point. From whatever angle one looks at the situation, there are serious political dynamics at play in the ex-Speaker Bankole fraud saga and the decision of the government and the EFCC to pursue his prosecution at this stage. The hope of most Nigerians however is that political intrigues notwithstanding, Bankole if found guilty would be made to face the full wrath of the law, and that he would not end up with a slap on the wrist or an ultra-short jail term as Tafa Balogun’s or Bode George’s. This is a new administration, if President Jonathan wants to be taken seriously in this purported zealous attempt at tackling corruption, then justice should be allowed to prevail and the numerous pending cases of many other former public office holders especially ex-governors should be dusted, re-opened, resumed and prosecuted with as much zeal, fervour, commitment and speed as Bankole’s is being pursued now. This hope and optimism notwithstanding, I for one am not holding my breath. Nice piece Zainab, keep it up! EFCC operates just like a dog.